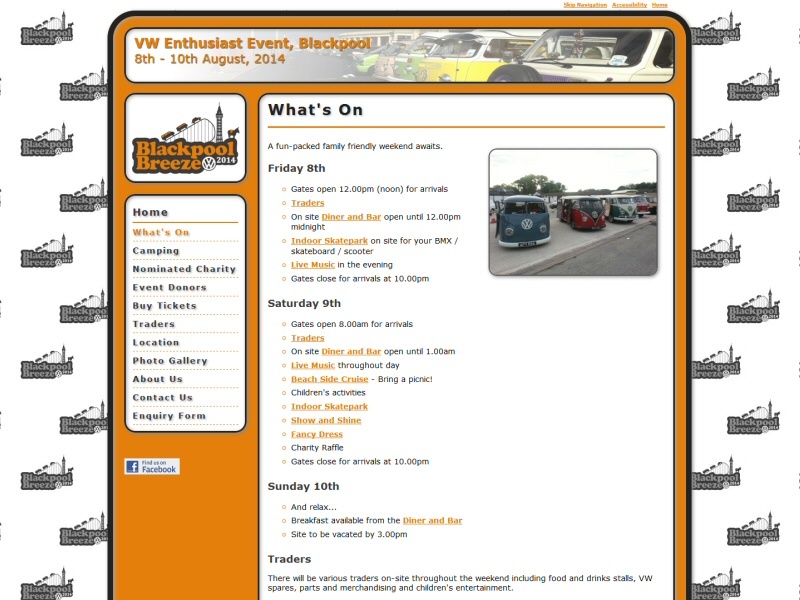 Website designed for Blackpool Breeze, an annual family friendly VW enthusiasts eventLooking for a website for your local event and need to sell tickets online or control numbers attending with free tickets? EasierThan Website Design can design a website to match your event branding, write promotional content if required, incorporate a built-in online ticket booking system integrated to PayPal (or a payment solution of your choice) and provide a back-end administration panel for the export of ticket sales. And if your event is an annual one, we'll happily offer discounts on subsequent years, where your requirements allow. All of our web design solutions include Domain Name Registration, website hosting and Email Addresses as standard, which are charged for at a favourable rate. Most of the myriad of available ticket sales solutions limit you in the set-up you can create. For example, what if you wanted to offer two free child places with each paying adult, but no more than two? Or sell a maximum total number of tickets, but were unsure how many of each type you might sell? A bespoke solution means you can have exactly what you want and brand it to feel like your event, not someone else's hosting environment. Annual event website featuring an online ticket booking system with payments via PayPal and a back-end administration panel.